High Probability Trade: Trade DBA or DBC and recieve a K-1 in the mail? 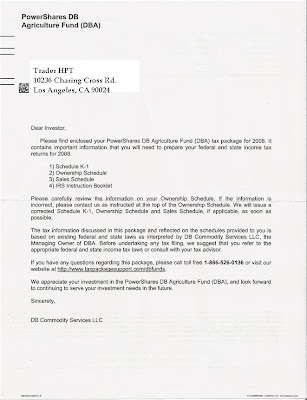 During the 2008 trading year I traded the DBA ETF (PowerShares DB Agriculture Exchange Traded Fund), and as a result I received a K-1 form in the mail from the DB Commodity Services LLC. I thought this was just some more stock junk mail, but it turns out, it was real and applies to my taxes. Doug Fabian posted a nice article detailing the matter last spring called "Avoid The Tax Trap of Commodity ETFs"
The Internal Revenue Service (IRS) taxes futures investments differently than equity investments. In contrast to equities that remain unsold, holdings in futures contracts and T-bills are marked-to-market at the end of each year. As a result, there is a tax consequence on commodity ETF investments even if they have not been sold yet. This leads to the cost basis of these investments being adjusted at the end of each year, Rich explained. One way to avoid these tax issues is to use IRA or other tax-deferred accounts for commodity ETFs, rather than putting them into taxable accounts, Rich said. Deutsche Bank had more than 380,000 different investors who owned its commodity ETFs in 2007, and each of them received a K-1 to complete their tax returns, Rich said. To assist those investors, Deutsche Bank provides a toll-free phone number, 1-800-578-8755, for them to call with any questions. 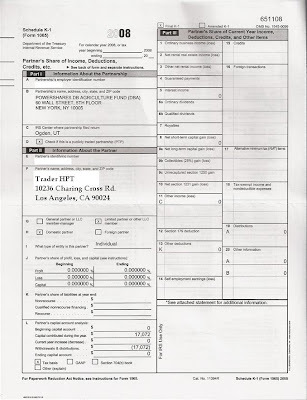 The investment firm also tries to send out all of the K-1 forms it needs to distribute no later than the second half of February to help its investors ready their tax returns in time. For investors who want to diversify into commodities, beware of the tax trap with funds that use futures contracts. If you want to steer clear of the year-end tax uncertainty, those who seek commodity exposure may want to consider using tax-deferred accounts for such ETFs or just buying ETNs. Fortunately for me, my trade in DBA was a day trade, so I had no interest income and my Net short term capital gain(loss) was also reported as ZERO on the form.